When this line is off-handedly asked by Jessie Cates (SISSY SPACEK) to her mother Thelma (ANNE BANCROFT) around six in the evening, Thelma tells her, believing her initial explanation for protection from criminals, despite how unlikely Thelma thinks a robbery would be. Jessie is nearing middle age, and is a seemingly recovered epileptic. After her husband left her and her drug addicted son ran away, she moved in with her mother, and things have generally been fine until this night. Soon Thelma realizes (excruciatingly later than we realize) why Jessie wanted to find her late father’s gun, which is to lock herself in her room, and commit suicide before the end of the night. Thelma then attempts everything in her power to keep this from happening. 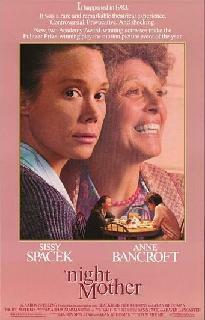 ’night, Mother is based off the Pulitzer Prize winning play by Marsha Norman, and its theatrical origins are pretty obvious; the setting and script are restricted, with nearly all action taking place within a small house, and with the exception of about a minute in the beginning, this is a 96 minute two hander between Spacek and Bancroft. There are a handful of problems with this movie, but the acting is certainly not one of them. Spacek is tragic and occasionally relatable as the depressed Jessie, and Bancroft is phenomenal as Thelma, grasping at any opportunity possible to keep her daughter alive through the night. No, the big problems are the screenplay by playwright Norman, who keeps our main characters bouncing around the house, draining any tension that is built up when the two women are standing or sitting still and speaking, and the cinematography by Stephen M. Katz which is far too jumpy to create an acceptable atmosphere, which is very important in a story intended to be claustrophobic and tense. However, there are additional reasons to admire the film. The music is condensed to only a simple acoustic guitar based piece at the very beginning at the very end – this is good, as ’Night, Mother heavily depends on dialogue and body language, which an overbearing violin score would have killed and turned into a melodramatic mess. The movie itself doesn’t jump around in time, restrained to one singular period, keeping any tension surviving from the bad cinematography somewhat intact. ’night, Mother is a movie that deals with suicide, a heavy handed and controversial subject, in a way that had potential for interest and praise. However, thanks to an extremely slow pace at the start and a poor stage-to-screen translation, it falls short. The performances of Bancroft and Spacek are indeed commendable and worthwhile, but when you stand back from a distance, that’s about the only purely positive quality within.